Locked out National Grid workers picketed a work site in Woburn. With locked out National Grid workers facing the loss of unemployment benefits in January, the Massachusetts House on Thursday approved and sent to the Senate a potentially precedent-setting bill calling for the state to set up benefits for any utility employee locked out in a labor dispute. Under the bill, which lawmakers hope will force an end to the National Grid lockout and a contract agreement with natural gas workers, the state labor and workforce development secretary would be required to establish “a benefit program for any individual who is involuntarily unemployed during the period of the negotiation of a collective bargaining contract because of an employer’s lockout.” The bill would apply to electric and gas companies. All program costs would be assessed on the employer that has locked out its employees, according to the legislation, and the bill precludes a utility from passing on the costs of the program to ratepayers. Before passing the bill Thursday with just a handful of representatives present, the House adopted two amendments sponsored by Republican Leader Brad Jones. The first amendment exempts municipal light and gas plants from the proposed law, and the second amendment sunsets the entire proposed law on Jan. 1, 2023. The bill now moves to the Senate, which could take up a bill as early as Monday, although no plans have been announced. National Grid and representatives of its locked-out gas workers are scheduled for more contract talks on Friday. With health and pension benefits for future employees a sticking point, both sides have repeatedly emerged from previous unsuccessful contract talks expressing disappointment with the other side. 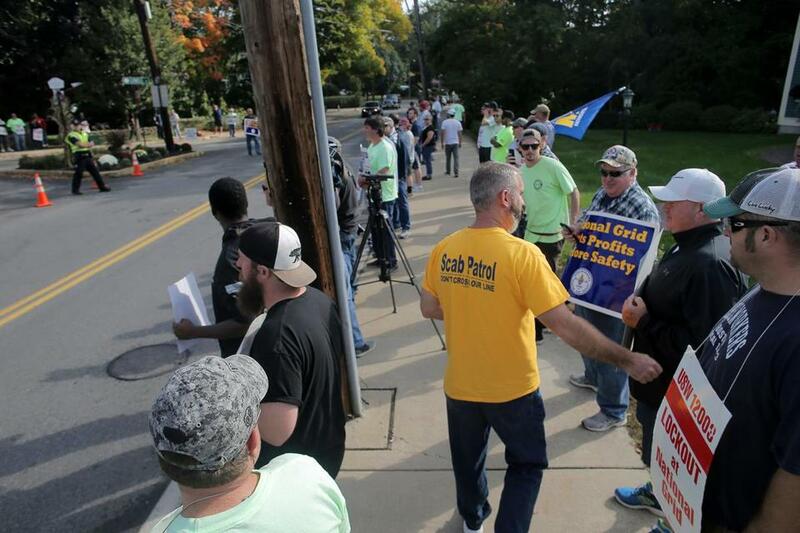 After unsuccessful contract talks, more than 1,200 union gas workers were locked out of their jobs by National Grid in late June and those workers lost their health insurance benefits. Some locked-out workers are on MassHealth and many of the workers are scheduled to lose jobless benefits in January. “I’m glad that the House advanced a bill today to create a program to extend the benefits for these workers. In addition to providing relief and security to these workers and their families, we built in protections for taxpayers and ratepayers — assuring that the cost of these benefits fall solely to the employer responsible for the lockout,” House Speaker Robert DeLeo said in a statement released by his office after Thursday’s session. While the House bill passed with bipartisan support, Governor Charlie Baker was non-committal when asked Thursday about legislation affecting benefits for locked out workers. “The devil in the details really matters on this stuff with respect to how it gets structured and organized, but I can say that we are as frustrated about the progress of that particular negotiation as anybody,” Baker said. The governor said part of the reason the Department of Public Utilities, with his support, put a moratorium on certain National Grid gas work was over concerns that the company lacked the manpower to safely perform the work expected of a large utility. “We are also concerned about what all this means to the people who are locked out, with respect to their families, and I think the Legislature trying to come up with some kind of approach to deal with this is a perfectly appropriate role for them to pursue. I do think the devil’s in the detail on it, but it is the sort of thing that deserves to be discussed,” Baker said. Matt Murphy of State House News Service contributed reporting.